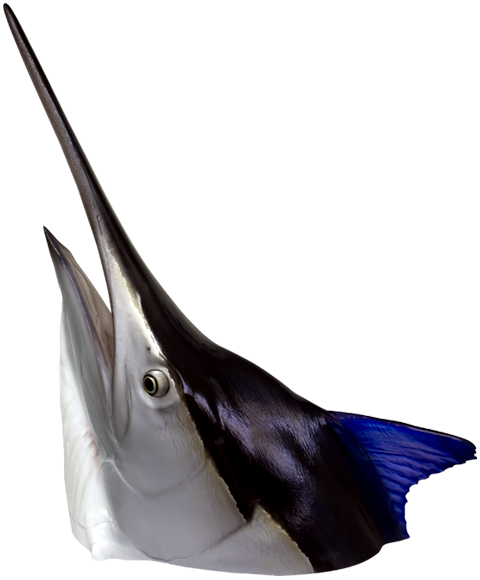 New Wave offers more than just traditional fish replicas and replica fish mounts. We are often commissioned to create sculptures for private and public entities. We have a reputation for helping design and integrate single and multiple pieces of art for use in wildlife museum applications. 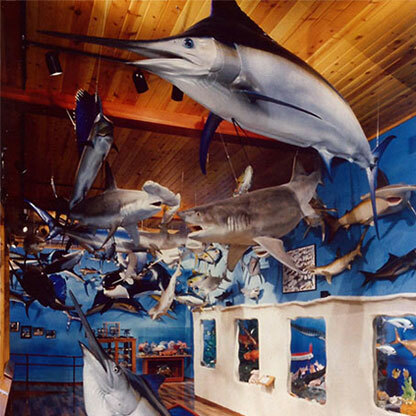 From individual mounts to large-scale museum work, we create fish art utilizing the skills and artistic abilities that have been perfected over the course of thirty years. Please review our different services below to gain an understanding of the type of work we are known for. We look forward to hearing from you and helping recreate a trophy mount that will surely turn heads, and last a lifetime. Accent elements are what make a custom mount. 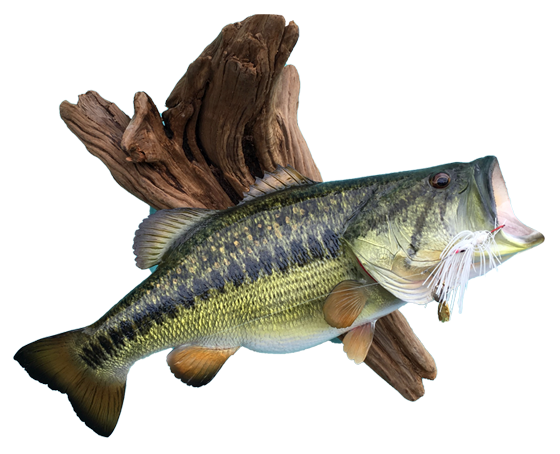 We can take your photos of a trophy fish and add different elements that place it in its natural environment. From lure and leader placement to mangrove and seagrass scenes, we can design and create a custom mount that visually places your fish in its natural habit. We have created many inshore mounts that incorporate everything from driftwood, lily pads, seagrass, sand, and baitfish. We also design and create offshore elements that marry your catch with lures, leader, baitfish, and even realistic silicon water movement that emulate your fish breaking the water surface. The sky is the limit when it comes to our custom fish replicas. We look forward to hearing your ideas and designing a piece of art that places your fish of a lifetime in its environment in a place that you can enjoy on a daily basis. New Wave Taxidermy and their team of artists will assist you in your design or help you create your trophy room. Your individual need is our connection with you to give you something personal and unique. We can offer a wide variety of custom wall, floor and ceiling hung pedestal displays that can be viewed from 360 degrees. From a trophy Bass or Trout with driftwood, lily pads and/or stream rocks to giant Marlin chasing schools of Dolphin or Tuna. You will never tire of a creative display that captivates a fish’s environment. Any fish replica turned into a wall mount. We custom design and install mounting hardware based on the mounting surface as well as the application in which it will be displayed. We have designed and installed mounting hardware that allows for both horizontal and vertical mounts. Sculpture creation is a unique service that New Wave offers. There are many uses for a sculpture. We have created custom sculptures for use on commercial signage, as well as accent art for private and public spaces. 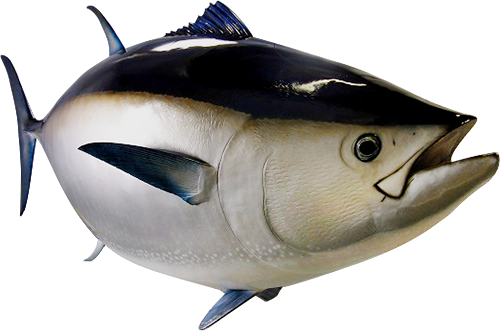 We can take any idea, at any scale and produce a lifelike replica of any fish desired. Our process for creating these magnificent works of art is detailed and requires a keen eye for shape, color, and texture. We take our design and mold our shapes from foam or clay. We then cast that shape utilizing our special process. This allows us to capture all of the details that are so important. We then paint and deliver a product that is sure to become known as a local landmark. Utilizing our sculptures in an outdoor environment requires a special coating that blocks UV rays as well as shields against outdoor elements. Once we have created your special mount and captured all of the excitement and detail of your trophy, the next important step is crating and shipping. We offer full service crating solutions to all of our customers. Whether it is one fish or 100 we will custom build a crating system that will ensure that your mounts arrive in perfect condition. 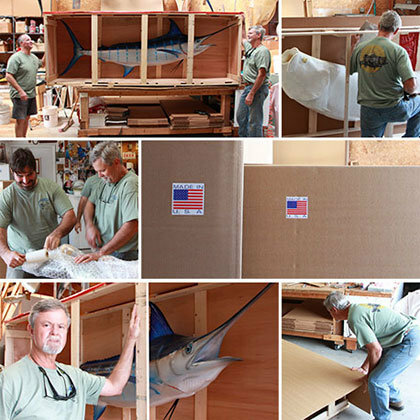 New Wave ships fish replicas all over the world. We will go over all of your shipping options with you before your fish leaves our facility. To learn more about our shipping rates and crating options, kindly give us a call and we will gladly answer all of your questions.